The School of Oracles offers comprehensive, in-depth training in learning to read the Tarot. The course is comprised of 50 classes. It is the school’s purpose to send skilled readers into the world. New classes do not begin until a current course is complete. The Tarot is a handbook to higher consciousness, a book of wisdom disguised as a pack of cards. The Tarot can be used to accelerate the process of Self-realization. In the thirty seven years of studying and teaching, I have become a master Tarot teacher. I have been on the faculty of The New York Open Center for over 26 years, teaching Tarot and the Western Hermetic Tradition. The Tarot is a river of knowledge into which the streams of Kabbalah, Alchemy, Astrology and Hermetic philosophy have flowed. This miracle of life enables us to communicate with levels of consciousness not normally available to the everyday mind. Composed of a series of transformative images, the Tarot is primarily a method of divination rather than fortune telling. Divination means; “to communicate with the Divine”. In the Hermetic Tradition the Divine is within, it is our own Higher Self. The Tarot turns your attention to the deeper meaning of things. It can give you insight into any situation, especially, insight into one’s self. It will gladly show you, at any given moment, the lesson life is teaching you, the outcome of your choices, and how to come to your highest state of consciousness. Tarot allows you to use the circumstances of life as lessons along the path. A common misconception is the belief that one must be psychic to work with the cards. This is not true. 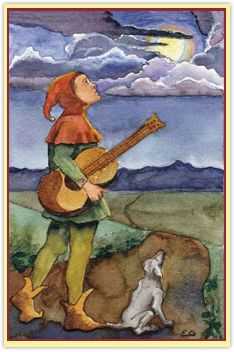 However the converse is true, working with the cards will greatly develop your intuition. Although the Tarot is user friendly at all levels of development, knowledge of the correspondences to Kabbalah, Alchemy, Numerology, Astrology and Archetypal symbolism can give access to ever-deeper levels of meaning and use of the cards. This class will give the students a basis in all of these traditions. In the class we will use meditation and inner journeys to awaken the intuition (The Inner Tutor) and develop a personal relationship with every card. You will learn to hear The Inner Voice, and discover your own inner Tarot Teacher. There will be abundant reading practice and you will learn how to read the cards for yourself and others. The Tarot will become a friend for life. You will be able to use the cards both personally and/or professionally. The Rider-Waite cards will be used as the basis of discussion in class, but the material is applicable to all decks. The class meets three evenings a month and begins at 7:15pm. It is one hour and forty-five minutes in length. Class size is limited to 8-10 students, and this assures individual attention. Each course encompasses five semesters. These semesters are comprised of 10 lessons each. There will be fifty lessons in all. The course is a journey we will take together as a community, and much concerning the class will be decided by class consensus. There will be liberal vacations in the summer (2 months aprox), and at holiday times. Each class will be recorded in the event that a class must be missed. The fee for the entire course is $2,500. Classes are held at 11 Cornelia Street, in Manhattan’s West Village.